Mario and Zelda (amongst others) creator Shigeru Miyamoto was in Paris to promote the launch of the Nintendo 3DS as a guide in the Louvre. 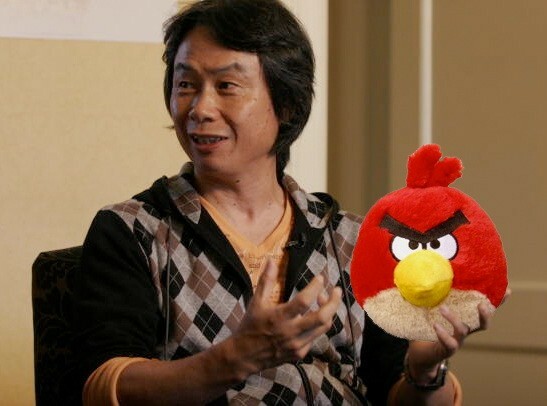 While company executives have previously dismissed and decried smartphone gaming, Miyamoto was asked about his favorite non-Nintendo game and for the first time, admitted that Angry Birds is his favorite. He said that he can tell Rovio is “having fun developing the game” and that it has a “very creative side,” that was “inspiring us to try even harder, and create even more unexpected new things.” Except for those moments when he steps into the hallway for a spot of pig-smashing, as you do. Shigeru Miyamoto admits he’s a fan of Angry Birds, just like the rest of us originally appeared on Engadget on Thu, 12 Apr 2012 12:19:00 EST. Please see our terms for use of feeds. 12 Sep	This entry was published on September 12, 2012 at 9:05 pm and is filed under Uncategorized. Bookmark the permalink. Follow any comments here with the RSS feed for this post.